A heartwarming and entertaining story built around asking for help, making decisions and the relationship formed between a young boy and the dragon he finds under his stairs. 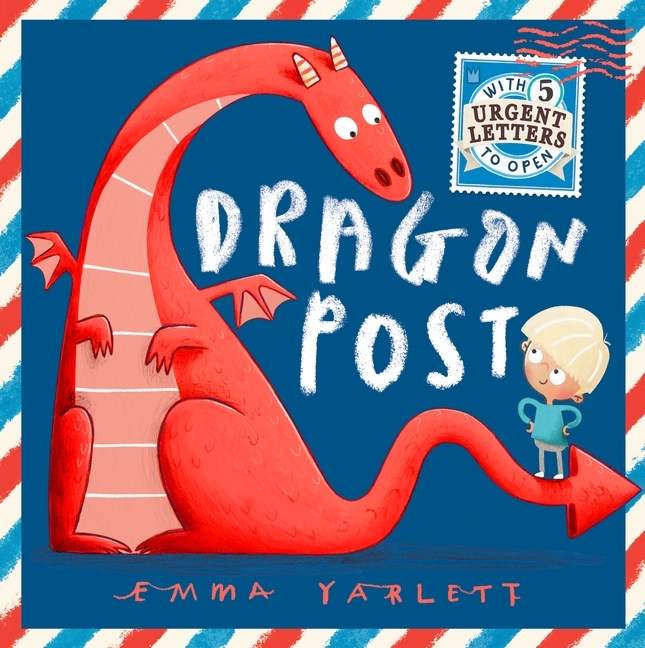 With interactive letters to read, and gorgeous illustrations Dragon Post is a fabulous novelty book. Alex has found a dragon under the stairs in his house, luckily he knows who he should write to for help. In return, he receives some helpful information on dragon related matters, beginning with an urgent response letter from Fire Brigades Chief Firefighter ‘HY Drant’. There are five letters to remove from envelopes, each delivering their own amusing advice. A lovely relationship is formed between Alex and his dragon, from mealtime to night-time flights, their bonding experiences bring them closer and closer. Will Alex keep his dragon as a pet? Or will the practicalities of owning a dragon lead to another destiny? You’ll need to read the book to find out! A fun and tactile experience for readers, with thick quality pages inside a strong cover which looks like a giant letter. The story could be appreciated by children younger than five years, however, the envelopes and removable letters might be in a little danger of being torn or lost with a younger audience. Other books by Emma Yarlett and reviewed by Kids’ Book Review include Nibbles: The Book Monster and Orion and the Dark.